Since its launch 2012, the Raspberry Pi has sold more than 19 million units, 9 million of them as the Raspberry Pi 3 (RPi3). On Pi Day, March 14, 2018, the Raspberry Pi Foundation (the Foundation) took the opportunity to upgrade the popular model in the form of the RPi3 Model B+ (RPi3B+; Figure 1), thus finally fulfilling some of the community's long-cherished wishes: Gigabit Ethernet with a maximum of 300Mbps throughput, power over Ethernet (PoE) support, and an improved preboot execution environment (PXE) boot. The real highlight, however, is the new wireless 802.11ac module (see the "Precertified" box). For small-board computer (SBC) hobbyists, the RPi3B+ precertified wireless module is a highly interesting innovation to enterprises, startups, and the business world for integration into Compute Module 3 projects. Effective shielding has made it possible to certify the element as a modular solution. Thanks to this certification by the Foundation, which invested an enormous amount of time and money in the process, corporations can now launch wireless- and Bluetooth-capable Rasp Pi-based products for the networked Internet of Things (IoT) world, and it will be 10 times cheaper and faster than before, according to Eben Upton. Figure 1: The new RPi3B+ meets some of the community's long-cherished needs, including faster wireless and Gigabit Ethernet (figure courtesy of the Raspberry Pi Foundation). The new RPi3B+ , like the Pi Zero W (wireless + Bluetooth) , was designed by Roger Thornton. The new model uses the same CPU as its predecessor, but now has a clock speed of 1.4GHz and features significantly improved heat management. The form factor has also remained the same: All connections, sockets, and LEDs are in the usual place. 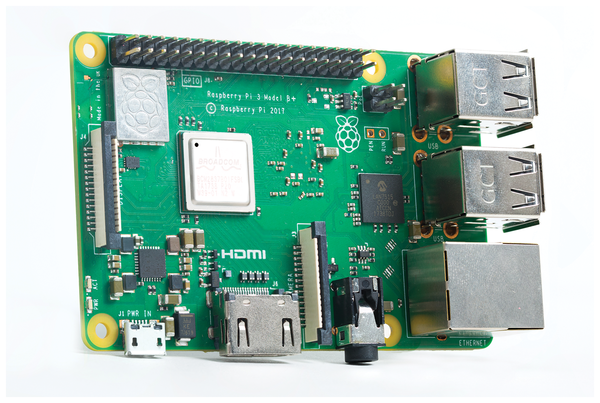 The RAM is still 1GB, because the VideoCore IV processor – the GPU and video core of the Raspberry Pi in all previous models starting with the RPi1B – only supports a maximum 1GB of RAM. The new Rasp Pi appears to be compatible with existing cases (I tested it successfully with a Tek-Berry3), HATs, and other accessories. The heart of the RPi3B+, the BCM2837B0 system-on-a-chip (SoC), has a metal "heat spreader" that dissipates heat better than in previous models. Internally, the BCM2837 did not change sufficiently to justify a new model number: The core is a 64-bit quad-core ARMv8-A Cortex-A53. However, the integrated heat spreader and some other optimizations allow the clock frequency of the cores to be increased to 1.4GHz – around 16 percent more than the RPi3B. The real highlight is that the hardware can consistently maintain this performance under load significantly longer than in earlier models. The Foundation has completely redesigned the computer's power supply. Thanks to the MxL7704 power management integrated circuit (PMIC), the board looks tidier by combining a number of previously discrete power supplies. The MxL7704 provides the various voltages required by different components, with significantly higher stability and the possibility of more modular adjustments. For example, it can supply the core with slightly less or slightly more voltage to influence performance and heat dissipation. Below 70°C internal temperature, the BCM2837B0 raises the CPU frequency to 1.4GHz; above this temperature, it drops to 1.2GHz. The MxL7704 reduces the core voltage in parallel, thus running the CPU at high performance for as long as possible, up to a maximum of 80°C. However, the CPU never typically reaches this threshold, so it will never slow down. Of course, all of these features come with a price: The RPi3B+ draws significantly more power than its predecessor. The designers therefore strongly recommend a high-quality 2.5A power supply. The official Foundation power supply  keeps you on the safe side. The well-known bottleneck, the single USB 2.0 bus with a 480Mbps gross data rate, continues to exist in the RPi3B+. However, the Microchip Technology LAN7515 extracts the maximum benefit. In addition to the four USB ports, you get a GigE LAN connection with 300Mbps real throughput, which is three times more than its predecessor. In everyday life (e.g., when streaming video from a USB hard drive), the data rate is lower because all data runs through the SoC and the single USB bus. At least PXE boot works better with the new LAN port. All known problems of the RPi3B with this remote boot procedure were fixed by developer Gordon Hollingworth in the boot ROM of the BCM2837B0. A forthcoming PoE Hardware Attached on Top (HAT) expansion board (Figure 2) lowers the 48V applied to PoE, in addition to data on the wire, to the 5V required by the Rasp Pi. The RPi3B+ routes the wires from the LAN socket for HATs via a four-pin header. 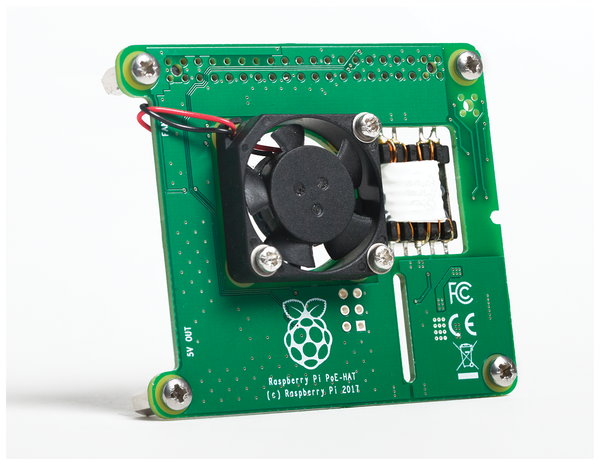 Figure 2: Using a HAT, you can supply the RPi3B+ with data and additional power, if required, via Ethernet (figure courtesy of the Raspberry Pi Foundation). In the future, thanks to PoE and PXE, an RPi3B+ can be connected by LAN cable and started without an additional SD card or power supply. A fan on the PoE HAT ensures that the SBC does not overheat. Hardware offloads AES and TKIP encryption, relieving the load on the Cypress CYW43455 single-chip 802.11ac (formerly a BCM43455) WiFi chipset when encrypting wireless network traffic. The CYW43455 is fully backward compatible with IEEE 802.11a/b/g/n and transmits in the 5 and 2.4GHz bands. The chipset supports a single spatial stream (1x1) for a data rate of up to 433.3Mbps – PHY (physical layer) gross data rate – over 802.11ac. It can handle 20/40/80MHz channels with optional short guard interval (SGI); the 80MHz channels were added by the 802.11ac standard, which means, the broader the channel, the more throughput. Theoretically, 802.11ac supports channel width up to 160MHz. However, hardly any devices are on the market for this, and the Rasp Pi would not benefit from it anyway. The CYW43455 is connected to the RPi3B+ SoC via SDIO (SD input/output; the Arasan eMMC memory controller built into the SoC). The Broadcom SD controller itself does not support SDIO and therefore only serves the SD card. The Arasan controller supports the SDIO v3.0 interface according to the specifications; however, it seems unlikely that it also supports the DDR50 (dual data rate at 50MHz with up to 400Mbps throughput) and SDR104 (up to 432Mbps throughput) transmission formats offered by the CYW43455. The Arasan device normally runs on the RPi3B+ at a clock speed of 41.6MHz. When transmitting 4 bits simultaneously, you can achieve 166.4Mbps and, with support for DDR, even 332.8Mbps. Apparently, various circumstances prevent clocking the controller at 50MHz. In practice, the limit will therefore be 166.4Mbps throughput. In any case, compared with the RPi3B, this is already double the data rate and could be better exploited in the less densely populated 5GHz band. Connecting via the SDIO means that wireless traffic does not depend on the USB port, providing more bandwidth for do-it-yourself routers. In everyday use, up to 102Mbps throughput in the 5GHz band should be realistic. All this indicates that the Arasan SDIO port is the bottleneck. As with the Pi Zero W, the antenna is a Proant PCB, so the RPi3B+ should achieve slightly better performance (throughput, range) in the 2.4GHz range than does the RPi3.